My post last night about the “Myth of the 76% Adjunct Majority” generated a fair amount of discussion, including a lengthy response by Aaron Barlow of the Academeblog. At its core Barlow disagrees with my separation of adjunct faculty from other non-tenure track faculty, arguing instead that the two should be counted together as “contingent” faculty. While it is certainly fair to examine the nature of the non-tenure track academic job market, I’d simply note that from an empirical vantage point it seems highly misleading to report summary data for two very different types of academic employment. Adjuncts are part-time faculty who are paid by the number of classes they teach (usually about $3,000 per class for a regular 3 hour undergrad class that meets for about 15 weeks). Non-tenure track faculty hold a full-time salaried appointment (the median is about $48,000 a year) with benefits in a department for the duration of their employment. That duration can range from as short as a single term to as long as a continuously renewable position, all depending on the terms of the employment contract. Barlow would prefer to lump these two very different types of academic employment into the same category for statistical measuring. I argue that they each face distinct challenges in the higher ed job market and should be examined differently. So take your pick – should we statistically record an adjunct teaching two classes for $6,000 in the same category as a Visiting Assistant Professor who receives a $55,000 salary to teach a 4-4 course load on a fixed appointment? I’d argue that some very misleading interpretations might follow from such a methodology. Yet contrary to Barlow’s claim, media reports using the 76% figure I quoted are ubiquitous. In fact, I directly linked to no less than five such erroneous reports in my original post. If he wasn’t preoccupied with assuming bad faith on my part and falsely insinuating dishonesty, Barlow could have checked any number of these. Consider the story at NPR that claims “Of all college instructors, 76 percent, or over 1 million, teach part time.” Or consider USA Today, which reported “part-time professors now account for over 76% of hired faculty.” And here’s a story at PBS, claiming “Adjuncts now make up more than 70 percent of all college and university faculty.” All of these claims are indeed false, and the entire point of my post was to refute this common error. Strangely that point seems to have been entirely lost upon Mr. Barlow though. One of Barlow’s fellow bloggers Martin Kich added another criticism of my piece that is at least worth considering in further detail. As I openly noted last night, the most recent set of statistics that breaks down the adjunct workforce in detail is based on an AAUP study from 2006. That’s only 9 years ago, and academia moves at a notoriously slow pace. But as Kich notes, the Great Recession happened in between. The recession issue is interesting, as Kich’s conventional wisdom holds that higher-ed employment has shifted toward adjunct dependency due to a contraction in university budgets and other recession-related constraints. This is actually an empirically testable thesis, although neither Barlow nor Kich seem to know much about the data entailed. 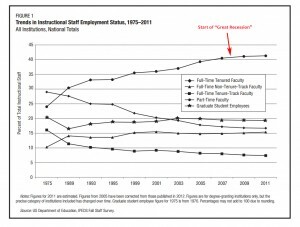 Fortunately the AAUP has also kept tabs on adjunct employment trends in the time being – or at least through their 2012 state of the profession report. Their numbers are derived from subsequent US Department of Education survey data. They are is less comprehensive than the 2006 study and do not include information about For-profit vs. Non-profit universities or other pertinent breakdowns. They do however track the total percentages of adjuncts in the academic workforce. Interestingly enough, the results show virtually no change in the percentage of adjuncts since the “Great Recession” started in December 2007. To the contrary, according to this survey the adjunct rate stabilized around 40% before the onset of the financial crisis and has remained there ever since (or at least through the most recently available data in the 2012 report). Interestingly enough, the real growth in the adjunct workforce appears to have taken place almost entirely before 2005 as part of a multi-decade expansion of adjuncts from about 25% to the current 40%. While the data do not specify further details on the source of this expansion, it is probably no coincidence that this period directly overlaps with the rapid rise of For-profit higher ed, which – as I pointed out last night – relies almost exclusively on adjunct faculty. It’s also worth making a final note on non-tenure track “contingent” faculty, since Barlow seems to think that they should be lumped together with adjuncts for statistical reporting. 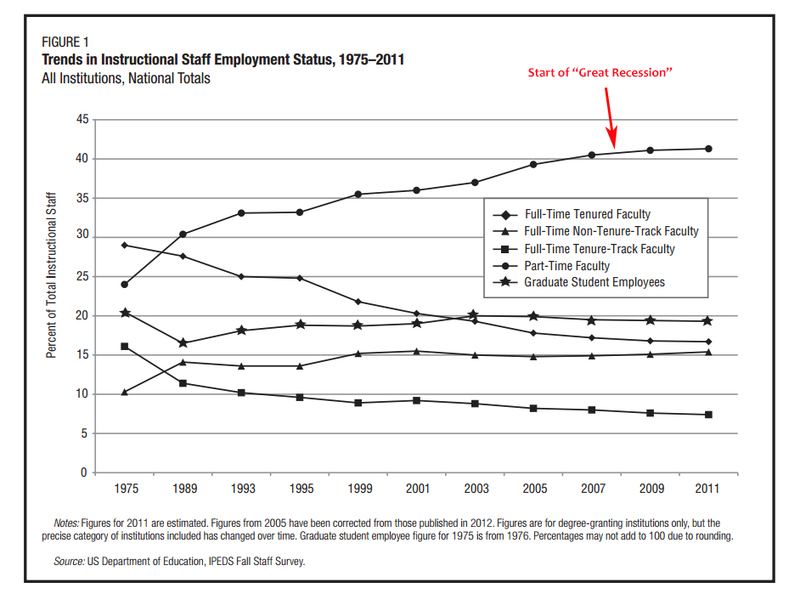 As the chart above clearly shows, non-tenure track full time faculty have shown almost zero movement in either direction for the past decade and a half. They comprise a stable 15% of academic employment – a level that has remained constant since 1999. This entry was posted by Phillip W. Magness on Saturday, August 22nd, 2015 at 4:27 pm	and is filed under Uncategorized. You can follow any responses to this entry through the RSS 2.0 feed. Both comments and pings are currently closed.